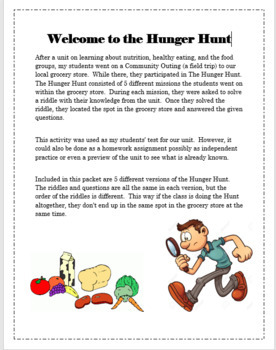 The Hunger Hunt consists of 5 different missions the students go on within a grocery store. During each mission, the students are asked to solve a riddle with their knowledge from a unit on nutrition/healthy eating. Once the students solve the riddle, they locate the spot in the grocery store and answer the given questions. This activity was used as my students’ test for our unit on nutrition and healthy eating. However, it could also be done as a homework assignment possibly as independent practice or even a preview of the unit to see what is already known. Included in this packet are 5 different versions of the Hunger Hunt. The riddles and questions are all the same in each version, but the order of the riddles is different. This way if the class is doing the Hunger Hunt altogether, they don’t end up in the same spot in the grocery store at the same time.